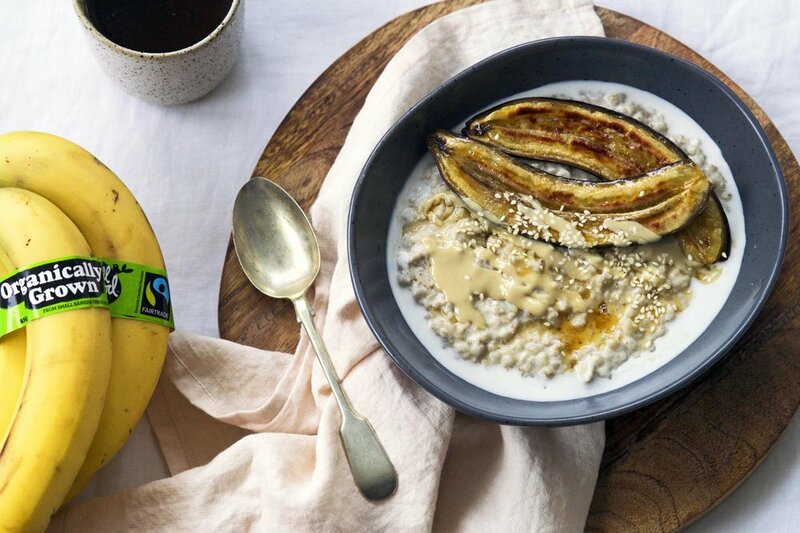 This rich and deeply nourishing porridge is a wonderful way to start the day. I like to soak both the oats and buckwheat beforehand to ensure they are easily digested. If you’d rather skip this step you’ll need to increase both the water and the coconut cream a little. I wrote this recipe for my wonderful friends at All Good Bananas. Their fair trade bananas are always found in abundance in my kitchen. They've been real leaders in providing ethical fruit to NZ consumers and I love working with them. Place the oats and buckwheat in two large bowls (each in a separate bowl) and cover with cold water. Soak for 8–12 hours. Drain and rinse well using a sieve. Place both in a medium saucepan along with the water and coconut cream. Bring to the boil before reducing to a simmer and gently cooking for 25 minutes. Stir regularly as the porridge can stick to the bottom of the pan. Add additional coconut cream or water if the pot becomes too dry. Porridge is ready when the buckwheat is tender and the consistency is creamy. Add the vanilla and nutmeg. Cook for a further minute. Remove from the heat and add the tahini and maple syrup. Taste and add additional sweetness if desired. Cut the bananas in half lengthways (leave the skin on). Lay on an oven proof tray lined with baking paper. Drizzle each banana half with 1 teaspoon of maple syrup. Place under a hot grill for 5 minutes. Remove from the oven and drizzle each with some of the melted butter. Spread as evenly as possible. Place back under the grill for 5 minutes more or until golden brown. Sprinkle a little sea salt on each. You can remove the bananas from the skin before serving or let your guests do this at the table. 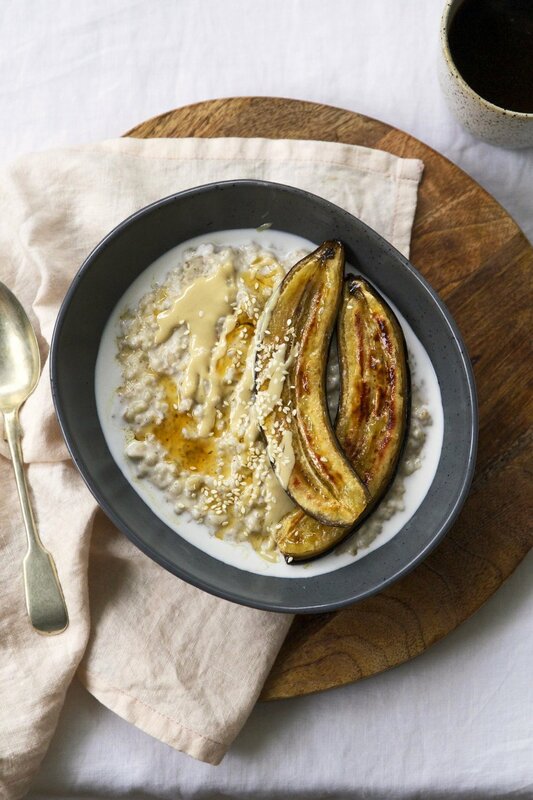 Serve on top of the hot porridge with additional tahini and maple syrup to drizzle. Serve with the dairy or non-dairy milk of your choice. Tip: If the porridge clings to the bottom of the pan while cooking, remove the saucepan from the heat and place a lid on top. Leave for two minutes before stirring again. The steam will loosen the porridge and you’ll be able to mix it again before placing back on the heat to finish cooking. Leftover porridge can be gently reheated in a saucepan with a lid on. Add a little more coconut cream, if needed, to make it creamy again.